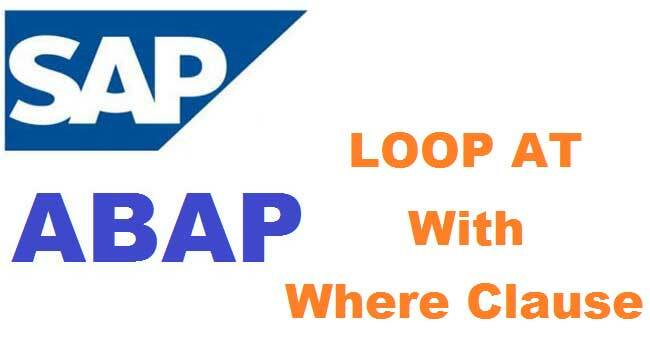 If one use a LOOP AT statement with a WHERE clause, the whole TABLE will be read through not only the entries that satisfy the WHERE clause. This can lead to performance problems when a very large internal table is being read many times with a WHERE clause. The solution is to sort the table on the keyfields, use a READ statement to find the first entry that satisfies the key. Then you can start the loop here, and check for changes in the keyfield to exit the loop. sort gi_mseg by matnr werks lgort. * if necessary check other fields. loop at gi_mseg into g_mseg from l_tabix_from. It would be better to define the table as sorted table <<with key>>. Then no read is necessary.